Too many spirals? I've thought about this. Spirals are one of the most common fractal structures we see, but they are also a very "robust" design element. Their circular shape makes them inherently balanced. This combined with the straight, linear stem suggests flowing movement, creates depth, and easily demonstrates the color combinations in a palette. This gives the apparently simple and plain spiral the potential to be quite complex and produce a great deal of variety. I started to avoid spirals because I thought they were repetitive and becoming cliche. Then I went with my own gut feelings and saved any image I thought looked good whether it was "yet another" spiral or not. Maybe everything I like is garbage. Maybe art is just our favorite garbage. 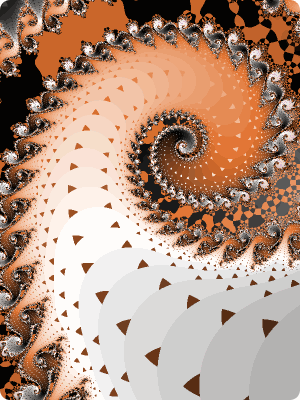 Another reason for so many spirals is that the Mandelbrot and Phoenix formulas produce the greatest variety of images in Xaos, particularly in Julia mode. These images consist mainly of spiral structures.